And the fallout over England's World Cup failure continues. Alan Shearer's criticism was pointed and biting. It's easy to rationalize now. After all, hindsight is 20/20. As much as Fabio Capello made mistakes, the bigger ones were committed on the field by the players. And how repressive can it be to ban cellphones during the dinner meetings? What TF! That's grasping for straws and things to hurl against the Italian. Capello still did a good job whether England crash out or not. The writing has been on the wall for years now. Time to look for solutions rather than point fingers, gentlemen. I was hoping that Japan would beat Paraguay last night. I thought they were the more cohesive side and with better scoring chances. But they were unable to find the back of the next. Any time you go to penalty kicks, it's all about luck, guess work, and well, guts. Yuichi Komano's missed PK was so huge. It immediately placed pressure on keeper Elji Kawashima. He could have stopped the first two shots that came his way but the Paraguayans adjust so he no longer had a chance of stopping them. I keep hoping for an Asian win hoping that the effect of a team moving to the round of eight will trickle over to our shores. I have theorized that the US making it to even the semis or finals would be so huge that the effect will be felt all over the world. Japan and South Korea had their chances but they went out. The Japanese midfielders have to do a better job of controlling that ball and not giving it away. On to the Spain-Portugal match. I've posted it before that the Portuguese clearly miss many of the players on the '06 team. Their current midfield corps isn't up to snuff. I like Tiago but he isn't like Kaka or even Mesut Ozil. There's no one to feed the ball to Cristiano Ronaldo. Speaking of Ronaldo, this was the perfect venue to strap that team on his back but instead he was hardly a factor. I guess missing Rui Costa, Figo, Deco, Maniche, and Postiga had a huge effect on the team. As for Ronaldo being captain. I'm not sure now. That burden of having failed in La Liga with Real Madrid and now in the World Cup must be heavy for him because he showed poor leadership at a time when Portugal needed it. And post-game, I don't know if you caught it on TV but it looks like he deliberately spat on the cameraman trailing him. So much for sportsmanship and leadership. Maybe you should hand the captain's armband to Eduardo or Pepe. At least they have passion and fight in them. Oh, and Spain having ball possession for over 60% of the match? They worked for that win and deserve to move on. The memory of Portugal's 7-0 pasting of North Korea is but a memory. Snapped this at the department store of SM. What's wrong with this jacket is that it's fake because the last time the Selecao used three stars (that indicates the number of World Cups they've won) was between 1970 and 1994. The year 1970 was the last time Pele played for the national side. Brazil would go on to win again in '94 when it was held in the United States and in 2002 when it was jointly held in Korea and Japan. The NCAA spared the players involved in the bench clearing and near brawl incidents in a Mapua-Perpetual game but cracked the whip on an Emilio Aguinaldo high school cager for a punching foul he committed in their game versus Arellano U last Sunday at The Arena in San Juan City. Management Committee chair Frank Gusi of host San Sebastian yesterday suspended Aldrin Guinita for a game for a punch he threw against an Arellano player. “He’s (Guinita) suspended for one game,” said Gusi. Mapua’s Ray Cabrera and Narr Garay, for their part, will not be sacked for a game for bench clearing that led to their ejection in a game they won over the Altas, 79-65. League commissioner Aric del Rosario also issued stern warnings to Perpetual Help’s Arnold Danganan, Chrisper Elopre and Mark Sumera and Mapua’s Jason Pascual and Michael Parala for their unsportsmanlike conduct. Danganan was slapped a flagrant foul he committed against Mapua’s Andretti Stevens while Elopre, Sumera, Pascual and Parala a technical foul apiece for pushing and shoving. “They were all reprimanded,” said del Rosario. The commissioner warned Danganan though that another flagrant in future games will mean automatic one-game suspension. Another three more will mean the offending player will be banned for the rest of the season. “We’ve instituted this new ruling because we want to prevent fights from breaking out. We will not tolerate this kind of behavior in this league,” he said. This is something my editor at the Business Mirror -- Jun Lomibao -- wrote while on assignment at the World Cup (what a lucky guy). Love this! JOHANNESBURG—The now legendary vuvuzela is no simple piece of instrument at all—unless one gets to master how to blow the horn to its full potential. The South African instrument that has been creating the biggest noise in the 2010 World Cup —literally, that is—takes a lot of breath from the uninitiated. Not only a lot of breath. The neophyte vuvuzela blower will find himself dazed after trying so hard to create that booming horn sound typical of a train passing through a level crossing or a trailer truck coming out of Port Area in Manila back home. Sometimes, it could be mistaken for a ship making a call in a port somewhere. The vuvuzela is a plastic instrument, a horn, that is a little over 2 feet in length. When blown, it produces a loud, distinctive monotone sound. Traditionally made and inspired from a kudu (a specie of antelope) horn, the vuvuzela was used to summon distant villagers to attend community gatherings. 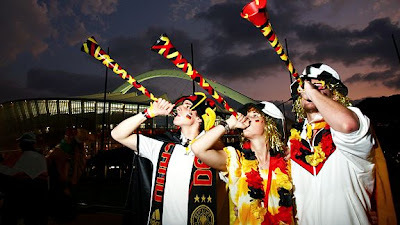 The vuvuzela is most used at football matches in South Africa, and it has become a symbol of South African soccer as the stadiums are filled with its loud and raucous sound that reflects the exhilaration of supporters. The vuvuzela sells at varying prices, and it all depends on how one has mastered the art and technique of bargaining. At the glitzy Melrose Piazza, a vuvuzela wrapped in South Africa’s colors or the flags of the 32 2010 World Cup countries cost 100 rand (roughly P700) each. There’s no bargaining at Melrose, of course. At the Chameleon Plaza which is about a hundred kilometers north of Joburg on the way to Sun City, vendors peg it at 120 rand at the most. Some tourists say they got theirs for 30 rand, others at 40, but being a stranger in Joburg—with nary the heart to stray into so-called dangerous territory—one would have to settle for the best bargain ever within his reach. Just the same, the vuvuzela has one distinct character, one unique personality that made it a hit—and earlier a bane—in the World Cup. But the vuvuzela is easier heard than blown, so to speak. Unless you learn the technique, which a South African or any of the initiated tourists would generously teach, of blowing it to its full potential, all you get would be, you guessed it right, a dud. Peeping into the vuvuzela makes one wonder how it works. There are no valves typical of a wind instrument. It’s actually like a telescope, only it’s made of plastic and does not have those thick refracting and reflecting glasses. What it does, actually, is it magnifies or amplifies what could be a monotone sound produced when one blows through it. And how does one blow a vuvuzela? Here’s a tip from a newly initiated vuvuzela fanatic. Press your lips together, as if tucking them in your mouth. Then press the mouth piece on your tucked lips then give out a little over mild blow—never mind if your saliva showers out of your mouth—and creating just a mild sound from the friction the outgoing air does between your lips. You would be producing short but potentially loud sounds from the vuvuzela. Master it and you would get the sound that created the loudest noise in the World Cup where the favorites, only some of them though, were defeated by the buzz of the South African horn and teams which booked some of the most unforgettable upsets in World Cup history. So would the vuvuzela fade after 2010 in South Africa then? Not so fast. Brazil is host in 2014 and the South American country that has the most victories in World Cups with five has its own version of the South African vuvuzela—the corneta. I can’t wait to hear that one. Yes, they are receptive to issues about the ball but not to officiating. "There are rules for size and weight. ... But the ball has to be perfect,'' he added. The ball has to be perfect? What about the game and the always controversial officiating? There’s no need to be perfect there? Damn right it was a mistake to put these FIFA officials in charge. Now there’s a censorship of incompetence going on. "I am very, very satisfied," Jose-Maria Garcia-Aranda, the head of FIFA's referees, said of the quality of officiating in the World Cup matches. Yes, he is satisfied. They have an agenda after all. And I wonder if they are watching the same matches as we are. When football's lawmakers ditched the idea of goal-line technology once and for all just over three months ago, FIFA general secretary Jerome Valcke said he hoped the decision would not come back to haunt the organisation at the World Cup. "Questions will always come, we just hope they will not come in the World Cup," said Valcke at the time. After the 2006 World Cup brawl between Germany and Argentina (where the Germans won via penalty kicks), German midfielder Torsten Frings was caught on video fighting with the Argentines. They used instant replay to determine who should be suspended for a match? What about the incompetent referees? What about the botched goals and calls? To say that it is part of the game’s mystique is even more moronic. Was I surprised by the 4-1 outcome of the match between England and Germany? Hardly. If you asked me that question 6 years ago then I’d say Germany would win but by a score of 1-0 or 2-1. Things changed for the stale German game when Jurgen Klinsmann took over as coach of the national team. He placed an emphasis on speed and quick passing and handed the twin striker positions to Lukas Podolski and Miroslav Klose. His successor, Joachim Low continued the kind of flowing offense but with a 4-2-3-1 system. Is that enough to convince me that they would have beaten England? The Germans were clearly the better side against England. Even if Lampard’s goal stood, what were their chances? Matt Upson’s goal was a header from a Steven Gerrard free kick. And so was Lampard’s. Those were the only shots they were getting at Manuel Neuer. Germany… they answered all those questions in their opening match against Australia whom they vivisected 4-0. They were carving up the English defense with terrific passing. They had no answer for Klose, Podolski, Ozil, and Thomas Muller. And still on that botched miscall on Lampard's non-goal (too many negatives don't you think) -- you gotta hand it to Neuer for reacting quickly. Had he stood aimlessly by then refs might have seen... nah. The officials are that stupid. And the three big questions heading into the tournament --- the first is Diego Marardona the right coach for Albiceleste? 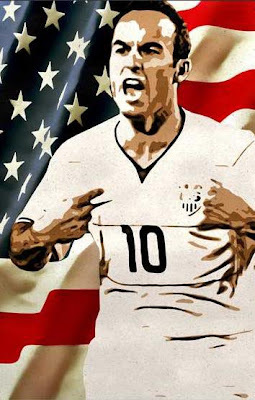 And two, can the US repeat their performance from the Confed Cup? And third, can the youth movement blend seamlessly with the veterans on Germany’s Mannschaft? All three answers are a resounding yes. The youth movement in Germany has been a success. In case you don’t know, the Germans are champions in three age levels in European football Under-17, Under-19, and Under-21. The only one they didn’t win was the U-20. Of the U21 squad, who impressed? Mesut Ozil, Manuel Neuer, team captain Sami Khedira, Mats Hummels, Gonzalo Castro, and Sandro Wagner. Also on that squad was Jerome Boateng. They beat England 4-0 in the U-21. Their coach Horst Hrubesch figured that his young players would make a good account of themselves come 2014 in Rio. But they have come of age in South Africa playing the most attractive football thus yet. Just to give you an idea of how good Ozil is, for Werder Bremen, he plays left wing. During the U-21, he was placed in the left and he still scored two goals. In the Finals against England, he was switched to his preferred attacking mid position and he still scored a goal. Now in South Africa, Low uses him on the right midfield flanks and he should how talented he is by adapting to the position and using not just his speed but his imagination in breaking down defenses. Much has been asked about the nationalities of Ozil, Khedira, and Boateng. It is a stupid question to begin with. Migration has much to do with this. All three were born in Germany. In the case of Boateng, there is a Ghanaian community in the Fatherland. The first two players of Ghanaian descent to play for the national team in the World Cup were Gerald Asamoah and Patrick Owomoyela. The former played well in Germany ’06. And Boateng, a last minute addition to the team, has started and played well. On that England side, the only one to crack the Three Lions’ starting XI in South Africa was James Milner. For the second consecutive World Cup, Frank Lampard scored zero goals. And Wayne Rooney was non-existent. When England needed pace and speed to counter Germany, where was Aaron Lennon? Fabio Capello left him on the bench. Lennon was successful coming on for David Beckham in ’06 where his speed terrorized the Portuguese. He even nearly scored. Instead England was slow and plodding. They should have used their youth players. Gerrard was right in one respect, they should not use the disallowed goal as an excuse. After all, the US saw Clint Dempsey’s and Maurice Edu’s goals disallowed too and those could have proved costlier for their side except that they didn’t stop playing. Of course, England did not. But John Terry was exposed as slow and unable to deal with the quicker forwards. I guess this is it for him and Jamie Carragher for national duty. Even worse for England, after their loss to Germany, some of the players’ belongings were stolen from their hotel. Police were able to recover the stolen items but so much for getting dumped on. A sign of a new venue to come? During the opening ceremony of NCAA Season 86, a globosphere came down from the rafters as part of the program. There was a symbolism that wasn't lost on me so I snapped a pic. I thought of a similar yet larger version of that stands just outside the Mall of Asia. Now there's a new facility that is being built around the area and it is reportedly said to be a sporting and concert venue of larger proportions. So I really can't wait to see the college leagues move there. Away from the shabby treatment elsewhere. Hahaha. What a symbol. This appears in the Monday June 28, 2010 edition of the Business Mirror. The Mapua Cardinals signified their intention as a contender in the Men’s Basketball Tournament of Season 86 of the National Collegiate Athletics Association with a 79-65 thumping of the University of Perpetual Help Dalta System Altas at the San Juan Arena yesterday June 27, 2010. Right from the start, the Cardinals’ second year guard Andretti Stevens got in the face of the Altas’ Jefferson Vidal as he refused to give the high scoring transferee from Philippine Christian University any daylight. Although Vidal hit 50% of his shots, he only had 10 attempts from the field for 16 points (with two coming from the free throw line). The tight-guarding Stevens also got the goat of the Altas’ Arnold Daganan when the latter planted an elbow on the fallen Mapuan following a pick and roll. That incident at the 8:20 mark of the 4th Quarter with the Cardinals up 58-50 nearly sparked a melee that saw the Altas’ Mark Sumera, and Chris Elorpe and the Mapua’s Jason Pascual and Mike Parala called for technical fouls. Daganan was assessed a flagrant foul while Mapua’s Raymark Cabrera and Narr Garay were both ejected from the match for entering the court. After a six minute stoppage where Commissioner Arica del Rosario stepped in to help calm the frayed nerves of both teams, the Cardinals proceeded to drop a mighty 29-15 finishing kick that put then atop the NCAA leader board alongside opening day winners San Sebastian and San Beda. The Altas were clearly in disarray following the disqualification of forward-centers Marlon Gomez and Paul Nuilan following eligibility violations. Gomez, is one of six former PCU Dolphins who transferred to UPHDS while Nuilan is a transferee from FEU. Gomez allegedly enrolled in JRU and Nuilan in Letran and did not complete their residency before suiting up for the Altas. Their absence was sorely felt said UPHDS head coach Boris Aldeguer who also said that their correct papers will submitted later in the week in a last ditch effort to get the two to suit up for the Altas. The defending champions San Sebastian Stags proved steadier in the endgame against a gritty Letran squad that played without the injured Kevin Alas for a 59-53 win. The second match of the opening day doubleheader pitted last year’s first runner up San Beda against Jose Rizal University. The Red Lions pulled away with an incandescent 21-7 3rd quarter highlighted by 10 points Garvo Lanete. San Beda, a heavy favorite to battle San Sebastian for the title coasted to a 68-52 win. This appears in my July 28, 2010 column in the Business Mirror. That’s was my thought as the Opening Ceremony of National Collegiate Athletic Association (NCAA) Season 86 reached it climax where its star-studded guest stars – Kyla, Iya Villana, KC Montero, Jay-R, and Billy Joe Crawford – jammed on stage for their rendition of USA for Africa’s “We are the World.” Not soon after that, the San Sebastian-Letran match got underway, it was obvious that these teams stand apart. Between them, there is only bad blood, cheap shots, and one upsmanship. To wit, during one Letran foray, Kevin Alas was fouled on his way to the basket. Stag Anthony del Rio tried to help him up. Alas ignored the gesture and instead waited for his teammates to give him a hand. Yes, sir. When you’re on the top, everybody wants to knock you down. If the Opening Ceremony was pure showtime, the opening match served up by the defending champion San Sebastian Stags and the Letran Knights was forty minutes of hell. In a bone crunching, take-no-prisoners, ugly-field-goal-shooting, defensive, and low-scoring manner. The former has won three titles in the span of nine months – in the NCAA, Philippine Basketball League, and the Fil Oil Invitational. The latter has been a punching bag of teams after losing seven vital cogs from its Final Four of the previous year. In the days leading to the opening, Letran played the University of Santo Tomas, University of the Philippines, and National University in succession. They gave squads from the rival University Athletics Association of the Philippines teams a dose of what they had in store for San Sebastian – that relentless fullcourt press and punishing defense. The day before Opening Day, Letran head coach Louie Alas paid his players a visit at their quarters and was surprised to see them all sporting a buzz cut. “O, (Senator Rodolfo) Biazon look kayo,” he jested comparing his wards’ short cropped hair with the shaven plate with that of former Philippine Marines’ Commandant and former Senator Rodolfo Biazon. “Sign of unity and commitment,” Kevin Alas revealed. It wasn’t just the scalps that were exposed but their ripped bodies as well. The team had undergone a demanding physical conditioning program and one would be hard-pressed to find an ounce of body fat on these guys including Jun Jun Alas who seemed never to shy away from buffet lunches. From the opening tip to the final buzzer, the unfazed Knights scrapped their way through the game. Following a Jaypee Belencion bucket to inch close to the Stags at 51-50, the defending champs unleashed an 8-3 wind-up on their spread the wealth policy. Four Stags scored – Calvin Abueva, Raymundo, del Rio, and Gilbert Bulawan in the final four minutes of that match to eke out a close 59-53 win. It was a close one, maybe even a moral victory for the Knights who could have pulled off the upset had second year point guard Kevin Alas suited up (he was out with a minor leg injury). Louie Alas was happy on one hand and disappointed at the missed opportunity at the other. “Because we lost, we’re doing weights tomorrow (Sunday) he said. They grunted and quietly dressed up (their thoughts on the just finished match and the words of encouragement doled out by former Letran great Kerby Raymundo who dropped by the locker room after the game). For the next three to four months, they hope that their season will come together… in this league where everyone stands apart. I was watching the Uruguay-South Korea match and as exciting as it was, I was trying to save my energy for the USA-Ghana tiff at 230am. It had been a long day for me and like the Azzurri's Fabio Cannavaro, I was running on fumes. It managed to finish some work but with my senses dulled I had no way to tell if it made sense or not. So I tuned things out and waited. Game time at 230. The Sons of Sam conceded an early goal once more. It was an excellent run by Portsmouth's Kevin Prince Boateng who scored Ghana's first goal on open play rather than a penalty kick. I wondered how bad could this be? England did the same and the US came back. However, Ghana's defense was superb. So I stewed and waited. Watched one botched chance after another until Clint Dempsey was brought down. Then Landon Donovan scored from the penalty area to level the match. But instead of gaining momentum, Ghana kept repelling their attacks. There horrors! Asamoah Gyan scored from a wicked left boot that skirted Tim Howard's fingertips. And there were to be no last minute equalizer to send it to penalties. On one hand, I am happy for Ghana. As the last remaining African team in the competition, it is always good to have representation in the face of a mounting South American challenge. But on the other hand, I so wanted to see the US go to at least the round of eight. That would have been huge! I couldn't sleep anymore. After all, what time was it? Past 5am? And so I wondered. The US still has a pretty good team. The concern about these comeback kids is -- can they come back and do this all over again? Some of them will be over 30 if not in their mid-30s by the next Confed Cup (2013) and World Cup (2014) with both competitions being held in Brazil. Keeper Tim Howard, right back Steve Cherundolo, and team captain Carlos Bocanegra are all 31 years of age now. Central Back Jay Demerit is 30. Forward Edson Buddle is 29 and line mates Landon Donovan, DaMarcus Beasley and Oguchi Onyewu are 28. Clint Dempsey and Ricardo Clark are 27. The only obvious retiree from this team will be backup keeper Marcus Hannemann who never got to see playing time in this World Cup. The task now would be to look for new central defenders since one wonders how much more pounding can Onyewu's knees take. And Demerit... well. Even Boateng's run came right through him and Bocanegra. But still, there is much to take away from this team. In 2006, the USA (maybe preposterously) were ranked 5th in the World. Their inability to get out of the group stage where Ghana also ousted them at 2-1 saw them tumble to #16 if I am not mistaken. Now there is even greater hope that they can become a real football power. Now, all they have to do is win the Gold Cup, do well in their qualifiers and when the time comes... beat Ghana. 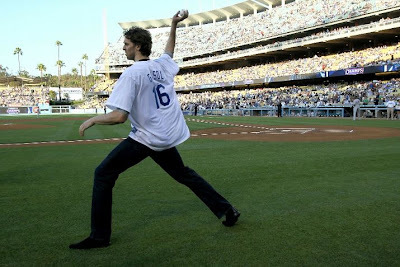 Pau Gasol threw the ceremonial first pitch in the match between the Los Angeles Dodgers and the New York Yankees (he's warming up in the pic above). It was the first game of the three game series and second ever series played by the two teams outside the World Series. It was also a reunion week between the Yankees and their former manager Joe Torre and Don Mattingly who are now with the Dodgers. Alex Rodriguez clubbed his 593rd home run to help NY beat LA 2-1. CC Sabathia got the win and Mo Rivera successfully closed the game out. Two more games to go in this series. NY is atop MLB with a 46-27 record. Uruguay is led by Atletico Madrid striker Diego Forlan (he took centerstage when Fernando Torres left for Liverpool). How dangerous is this 5'10" striker? He's won the Pichichi Trophy twice -- once in with Villareal before moving over to Atletico and the other two years ago with El Atleti. Since 2002, he's scored 26 times for Uruguay in international play. In this World Cup, he's scored twice both of them coming against South Africa in a 3-0 win. Korea is led by Manchester United midfielder Park Ji-Sung. If there is one thing that was obvious about the Koreans in group stage play is they are in superb shape with Park leading the way as he tirelessly tears up and down the pitch. He's logged 270 minutes for Korea -- meaning he's played every minute of all three matches so far and has had one goal (against Greece). Plus, he has yet to be carded. It's going to be a interesting match as the high energy Koreans go up against a dangerous yet unheralded Uruguayan side. In the main match and in television delay if I am not mistaken is Team USA vs Ghana. The USA definitely has shown that their Confederations Cup showing last year was no fluke. I think this is the fourth time they've made the Round of 16. The Americans' problem is their defense. Their back four is Carlos Bocanegra (LB), Jay Demerit and Oguchi Onyewu in central and Steve Cherundolo (RB). Their traditional weakness has been the left behind I figure in this World Cup, it's in the middle with Demerit and Onyewu. Demerit, who plays for Watford in England, has misplayed a couple of balls. Against England, I'd chalk it up to first match nerves but against Algeria he was better. They better be wary against the Black Stars of Ghana because their ground game is very good (their finishing could be much better though as both goals have been penalty shots by Asamoah Gyan). Their midfield and forwards have been superb on the other hand. 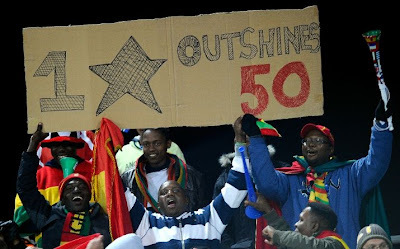 Doubly inspired by a past (Bill Clinton) and current president (Barack Obama), look to them to take the fight to the last African team in contention in the World Cup. 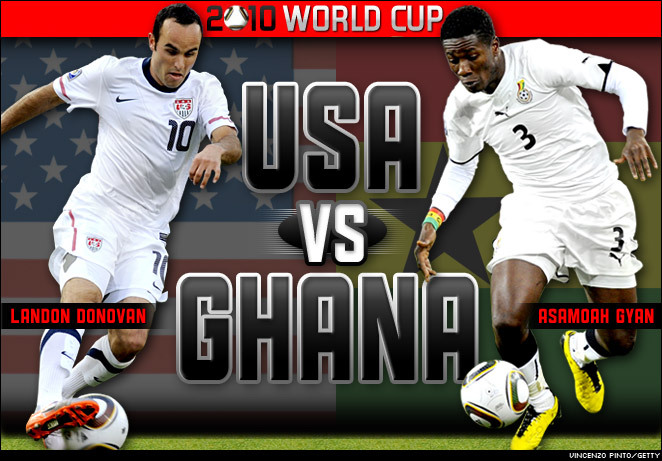 Ghana has some confidence against the US as they knocked them out of the 2006 World Cup 2-1 in Nuremburg. The Black Stars Stephen Appiah scored the deciding goal in that match (injury time in the first half). He's suited up thus far but isn't his former self after some injuries. The squad's best player Michael Essien of Chelsea is out with an injury as well. But Gyan will have plenty of help from Kevin Prince Boateng (the dude who injured Michael Ballack) who is a workhorse of an attacker. Of course, this is a far different, stronger US side than what they faced in Germany. Best goalkeeper of the tournament thus far: Portugal's Eduardo. And he was superb as well in 2006 in Germany. Those two huge saves against Brazil should make the highlight reel. Three goals each for David Villa (Spain), Gonzalo Higuian (Argentina) and Robert Vittek (Slovakia). Villa is with Barcelona, Higuain with Real Madrid and Vittek with Turkish club Ankaragucu. In 2006, I thought that Franck Ribery was one of the breakout stars. This tournament, I like Mesut Ozil, Germany's playmaker. Great speed and vision on the attack. Word is he is headed for -- darn it -- Manchester United after this World Cup. A toast, a cheer, a song, and a groan. The other night while watching the World Cup games at Gweilos in Eastwood the atmosphere was electric. In one table you had three French dudes, in another three American chicks, in another there were three Mexicans (what’s with these trios anyway), then in one table a Brit (finally!) with a couple of Pinoys. Most of the patrons cheered for the USA and when Landon Donovan scored the winning goal the whole place erupted! Some pounded on the tables with their fists while others chanted “USA! USA!” A couple next to me toasted beer bottles (Heineken if you want to know what brand) while another shook their heads (they root for England and an American win meant the Yanks won their group). The Americans stood up and sang “Star Spangled Banner.” I smiled, raised my glass, and said, “To Captain America (Landon Donovan)!” I downed my San Mig Light and wished that the Azkals would one day make the FIFA World Cup. It’s not being sarcastic but a dream. When Switzerland upset Spain, there was only one guy inside the bar who openly cheered for the Swiss. And when they scored he just stood up, pointed at the screen and yelled his head off. Many of us had our hands on our heads with mouths agape. I could watch the matches at home but it really is more fun in a bar with other passionate fans who groan, chew fingernails, and holler and groan some more with missed shots and close calls. Me? I’m more active when Team USA or the Les Bleus are on. 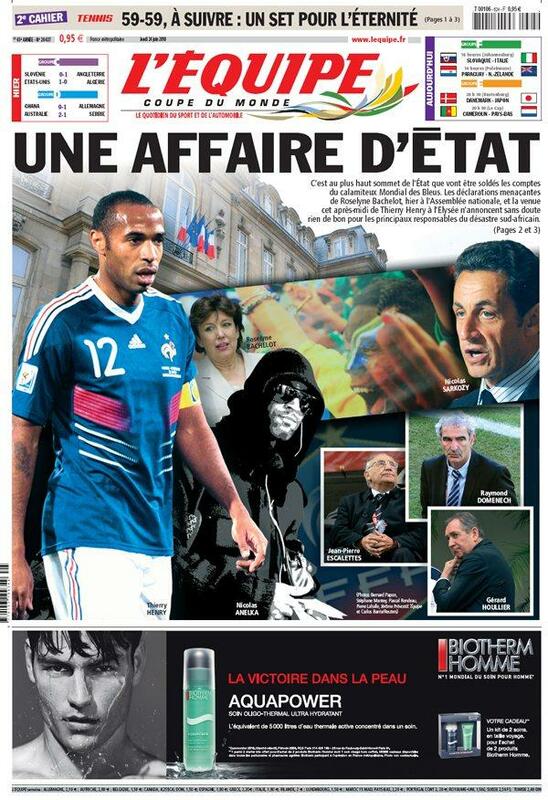 So you can be sure how dour and surly I was with every French misfire and controversy. The great thing about this World Cup is the upsets and the turned tables. The officiating is one of the most horrible and I can only pray that the fix this unless some stupid ref wrecks the finals. It’s Portugal and Brazil later. Hope it gets crazy in Eastwood. 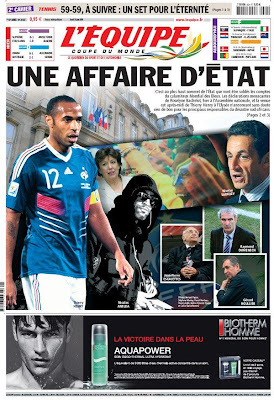 The French national football team returned to muted and cold silence yesterday although a few of them met with the French president Nicolas Sarkozy. Heads will roll for this most shameful performance and in the picture below, this is perhaps the last time these bunch will be together. 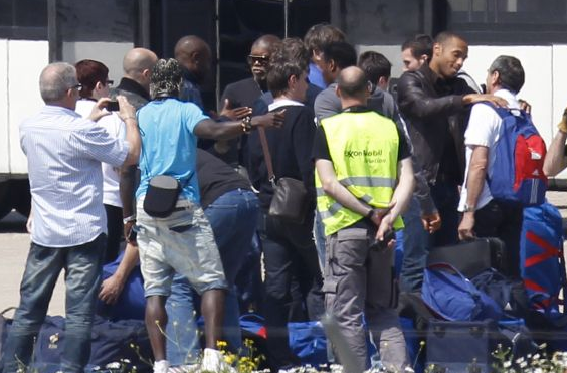 I can make out Bacary Sagna, William Gallas, Djibril Cisse, Hugo Lloris, Patrice Evra, and Thierry Henry as the all bid each other goodbye upon reaching French soil. Incidentally, the two finalists of the 2006 World Cup Finals -- France and Italy were booted out of the group stage. It's going to be crazy for the next few months as I've got a weird sked. My Ateneo Blue Eagles stuff will still be on ateneo.edu. With a colleague no longer with Business Mirror, I am doing the NCAA/UAAP beat fulltime so that will be in the papers. I have a column on Yahoo re: college hoops. I'm done with my NCAA previews. The UAAP stuff will be out either next week or the week prior to Opening Day. I'm done with it already. Just waiting for their publication. The Blue Eagles preview on the other hand will be out by month's end. The F1 and Brazil/Argentina overlap and affect the NCAA/UAAP. Between F1 and South America, the Singapore is easier to manage. I also have my work in Ateneo and in Makati so how I manage that is going to be a major accomplishment. Sooooo... lemme figure this out. Landon calling! One of the breakout stars of this 2010 World Cup. ON ENGLAND: Watching the England-Slovenia game, I was half-hearted in my hopes. I wanted them eliminated but also wanted them to advance because of Fabio Capello. 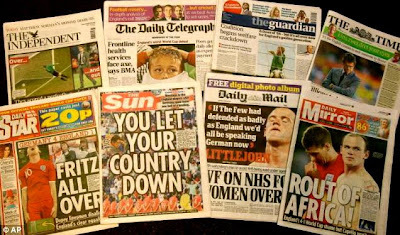 The aborted coup by John Terry was nipped in the bud but had England been eliminated then it would have been bigger news in the light of the implosion over at the French side. With "friends" like these, who needs enemies? I was shocked that he was calling teammates to a huddle after the match with Slovenia. That should have been Steven Gerrard's job, you git. You lost your chance and were a lousy leader who set all the wrong examples. Capello has won more titles than you and your teammates have collectively. He's gotten you this far and helped your side play better football. A few problems in South Africa now there's something wrong with the formation you play? Nothing was wrong when you guys qualified. And if you want Joe Cole to play maybe you should sit down. Shut up and play the game, John Terry. This appears in the Thursday June 24, 2010 edition of the Business Mirror. The Arellano University Chiefs were a pleasant surprise in their maiden year in the NCAA last season. They finished fifth with a 8-10 record and nearly made the last seat on the Final Four bus. They lost Gio Ciriacruz who made the Mythical 5 selection last season and to lose that kind of talent will have repercussions on their make up. What the Chiefs have are a collection of forward-centers who are almost all of the same height but who can all drive to the hoop and shoot from the outside. Easily, the most talented player is Isaiah Ciriacruz and he should be a go-to player when the Chiefs need to put points on the board, but he will have plenty of help from Andrian Celada. Jerald Lapuz replaces Gio Ciriacruz and should get better with more minutes. The Achilles heel of the Chiefs is their backcourt. Leonard Anquillo is no mere sidecourt attraction because of his height as he can provide some leadership. On the other hand, if Anquillo cannot get the Chiefs off the blocks or even hit the outside shot then they will be at a disadvantage. Rocky Acidre could start if Anquillo will not get the job done but he needs to make better decisions with the ball. The Chiefs have shown a startling propensity to collapse when the press is on. They have their work cut out for them but if they solve that then they could barge into the Final Four. The Mapua Cardinals could spoil a lot of things and upend a lot of other teams and make it to the Final Four. That’s the potential of this team. Of course, they could be a middle of the pack squad or tumble all the way to the cellar. However, one has to like how this team rounded out into fighting form in the pre-season. They didn’t win a whole of lot of games but they were fighting it out until the very end. Power forward Macky Acosta will be vital to his team’s fortunes. A big man with a good stroke from the outside as well as three-point range, if he’s on he can bring out the opposing big men. If he’s not, then there will be no second servings on offense. Also playing out their final seasons is forward Erwin Cornejo and guard TG Guillermo so expect them to give their all. Along with guard Allan Mangahas, their starting unit (along with center Mark Sarangay) will see a lot of minutes. With a long NCAA season, it’s vital for a Jekyll and Hyde bench to contribute or else it will be over for them. The good news is Jonathan Banal is back as he sat out last year with a knee injury. He provides some quality relief for Mangahas at the point. However, his scoring is still suspect. Rodel Ranises seems to have found his shooting touch from the outside and will be a huge help off the bench. If there’s one thing that’s obvious about the Cardinals is that they love to shoot from the outside. An off day will be a long day and a long season for them. This year’s edition of the Letran Knights is Louie Alas’ weakest team ever. They know that and everyone else does. But what everyone else knows is that they will have to work hard to eke out a win. With JRU’s talented core of recent years gone and with them the “bad boy” tag, that falls now to the Knights. “Never give in. Never give up.” It’s more than a slogan. It’s a warning to all who dare take the floor with them. Now if Frank Dysam can finish some plays and Belencion light it up from the outside then they can still upend Arellano for the four slot in the semis ticket. If Letran will rely on all hands on deck if they want to get anywhere, the PCU Dolphins, er, Perpetual Help Altas of Boris Aldeguer will live and die with their trio of high scoring guards. Jett Vidal (there are four former Dolphins in this year’s Altas line-up) will lead this team in scoring and could become one of the NCAA’s best with his deadeye shots from beyond area code and his slashing drives. There’s Chris Elorpe who will have a lot of help in the backcourt from Vidal and Arnold Danganan. If all three have their game on and they light it up from the outside as if was Christmas in June. They would have had better chances had Marlon Gomez and Paul Nuilan suited up. But the two had been declared ineligible at the last minute because they had also enrolled in other colleges. That leaves Harold Sumera and Raffy Ynion to carry the fight inside. If Ynion can work himself into proper game shape and take less outside shots then they’ll be slugging it out. From a starting vie and a sixth man, for College of Saint Benilde Blazers, they will live and die with their backcourt of Mac Abolucion and Carlo Lastimosa. And of course, there’s former Blue Eaglet Luis Sinco and RJ Agramino who will also provide scoring. Center Robbie Mañalac and forwards Ian dela Paz and Mark de Guzman will have to make their presence felt if they want to tow the Blazers out of a seventh straight losing season. And rounding out the NCAA is the Emilio Aguinaldo Generals. They were touted to contend in their first year in the NCAA but the loss of key players to eligibility and a rough welcome to the Grand Old League knocked them out early. Too often they found themselves on the receiving end of blowouts and they finished seventh with a 6-12 record. Guard Argel Mendoza will lead this team in scoring and will vie for scoring duel with the Altas’ Jett Vidal. But that isn’t the target. A higher finish is. The knock on the Generals is that they play well for a half then have disappointing tendency to fold in the second half. Hopefully they have learned from last season but after watching them once more flounder in the pre-season, one wonders if it’s going to be more of the same this Season 86. The Generals’ charge will be led by Claude Cubo, Jeff Lapitan, Lowell and Russell Yaya, and Franz Chiong. Now if they only subscribe to the adage that the best offense is a good defense then EAC can make things pretty interesting. As a youngster, I rooted for that team of one-name wonders -- Brazil. That is until the mid-90's when I shifted allegiances to France that had players like Youri Djorkaeff, Didier Deschamps, Laurent Blanc and the young turks of Lilian Thuram, Patrick Vieira, and Zinedine Zidane. If the Spaniards are lauded for their sterling and amazing midfield of Andres Iniesta, Francesc Fabregas, Xavi Hernandez, Xabi Alonso, and Sergio Busquets then the French had the same with Djorkaeff, Vieira, and Zidane. What magic was conjured from their play! It was a great time to be a fan. Because of Zizou, I rooted for Real Madrid too (now isn't that confusing since I like Barcelona). I purchased his Real Madrid #5 for almost $100 and that too remains a prized possession. There aren't too many national sides of which I can tell you the entire roster with their football clubs and field positions and France is certainly one of them (the others are the US, England, Brazil, and Spain). During the singing of La Marseillaise, I can match all the names with the faces. I am a fan of French football and it is a goal of mine to have all the jerseys of every single French Ligue 1 club (I have a long ways to go). Is there a Frenchman inside of me struggling to get out? Hahaha. Not at all. But I loved Anatole as a kid and enjoy Ratatouille. Good friend Chris Soler says I like players more than teams. In a way I do. Zizou and Djorkaeff had a lot to do with that. During Germany 2006, I finally snagged for myself jersey number 10. It was one of things I stuffed inside my backpack as the floodwaters of Ondoy engulfed my home. One of our househelpers damaged it while ironing it (yes, I know it should be) and I have been beside myself looking for a replacement. I see knockoffs and damned if I am going to wear one. So help! But back to the football team. I recall coach Aime Jacquet also being pilloried in the French media as being clueless and not too bright (much the way Raymond Domenech is now being skewered). Les Bleus went on the win the World Cup in 1998 and Jacquet stepped down amid cries from the hypocritical media who now urged him to stay. The team was on a roll as they went on to win Euro 2000 with that was won when David Trezeguet scored the golden goal in extra time. A year later, still under a different coach, they also won the Confederations Cup 1-0 as they beat Japan. They would also win the tournament three years later. Am not sure if any other country has done that -- win all three major football competitions in succession. As the managerial position fell to Domenech, who saw his best years as a player with Lyon where he played in the back four. Sure there were protests again about his style of play that was cautious and slow. The return to active duty by France's "Golden Generation" for one last foray in 2006 in Germany was instrumental in getting them to the Finals. But the French were hardly world-beaters until Zizou discovered the fountain of youth as he inspired Les Bleus to that now infamous match against Italy. It seems since that moment where Zizou knocked down Marco Materazzi with a headbutt, the French has always been on the wrong side of the news. 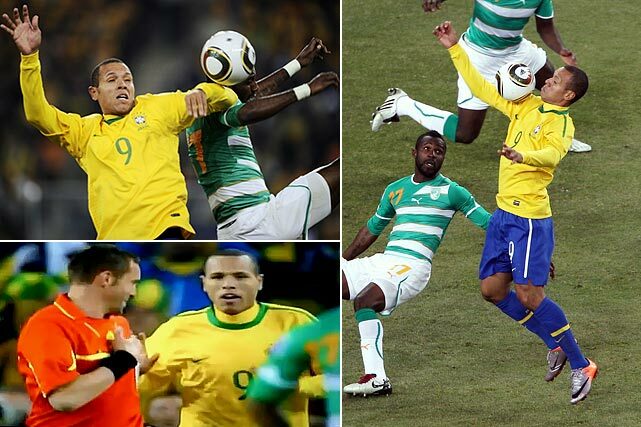 One can say that it's karma considering Thierry Henry's disgusting handball that allowed them to beat Ireland. That was certainly tough for me as Henry is one of several French footballers I admire. I have a few Les Bleus jerseys -- Zidane's 06 of course, Govou, and Henry. It has been hard rooting for the team. As I wrote earlier and prior to the tournament, the French are always a slow starting team. And as it was in '02, they were bounced from South Africa in the most embarrassing fashion with the team squabbling and rife with insubordination. As I watched South Africa's Bongani Khumalo's goal beat Hugo Lloris and see Oscar Ruiz harshly send off Youann Gourcuff with a red card, I felt so sad. If I felt bad over Spain's loss to Switzerland or the US getting jobbed by a dumbass referee, this was worse. Earlier before the match, television cameras caught the embattled Domenech walking forlornly on the pitch by himself. I have never been a fan of his as coach but these are the things one doesn't wish on anyone. Then they went down 2-0 and it could have been 3-0 but an offside was correctly called on Bafana Bafana. Florent Malouda pulled one back but it was all over for France. Then there was that final misunderstanding with Carlos Parreira at the very end. I shook my head and went home. Except that I found a bench (in Eastwood) and sat down for a few minutes feeling bad for my fave football team. There was a light drizzle. Not that it bothers me. 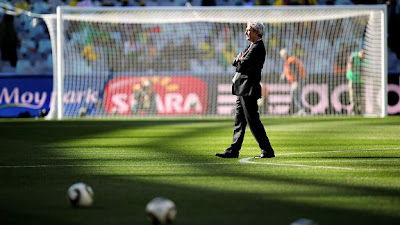 Now that I think about it, it sort of reminded of Domenech alone on the pitch of Free State Stadium.